Clark and I stood in disbelief at the scene before us. The Weber River is normally a wide, meandering affair, cutting through the heart of Park City and Summit County, just east of Salt Lake City. I’ve fished it before during the winter, but I’d never seen something quite like this. The Weber was so frozen over that only a thin ribbon of water rushed through a gap in cracked, but thick, ice sheets. I’m no stranger to winter fishing and frozen rivers, but I’d never seen the Weber so diminished by a Utah winter. No one would’ve blamed us for leaving, but anglers have an odd sense of defiance in the face of stupid odds, especially if we haven’t yet stepped into the water. Any steelheader will confirm this. So we geared up, tried not to slip and die on the ice, and got to fishing. It was predictably terrible, but we stuck it out for an hour before we felt we’d tried hard enough to admit a proper defeat. Neither of us had so much as a nibble the entire time. At some point it got personal and we had to prove, for some unknown reason, that fishing in the dead of winter is worth the effort. We left the Weber and headed south, back toward Utah Valley and the Sundance Ski Resort. I looked wistfully at the snow-covered slopes of Mt. Timpanogos and reckoned my day would’ve been better-spent skiing than fishing, a thought I often have during winter’s doldrums. We were in Provo Canyon now, and I glanced his direction. The Provo River is one of the most crowded, overused, yet somehow still productive fisheries in the country. I’d say the upper two miles of the Provo, below the Deer Creek Dam, receives 80 percent of the river’s traffic. I’d never seen a soul fish the section Clark pointed at. So we pulled over, rigged up, and got to fishing once more. The conditions were much more promising, though. For starters, the river wasn’t iced over. Then, 15 minutes into fishing, Clark yelled and broke the water’s silence. Clark stood 100 yards or so upstream. His rod was bent over double. Right as I looked, a big splash disrupted the river’s surface, Clark’s rod went limp, and he called the river names I can’t print. Clark missed a big fish – it happens to the best of us – but he and I finished out the day strong. We ended up finding a mess of whitefish, a few smaller browns, and I landed a stout rainbow nearly 18 inches long. It was an unexpected ending to a day that began horribly. Then again, if you knew the ending to a fishing trip before you went, you’d likely never go. And that’s part of what I love so much about winter fishing. Yeah, it’s more work than usual. That just means the payoff is a bit sweeter as well. Winter fishing has other perks, too. Aside from the story I just shared, this is what keeps me coming back to the river winter after winter. Utah is the second-driest state in the nation, which means my local rivers and streams are pretty crowded. Add to that Utah’s uncanny knack to have its roads parallel most of its best rivers, and you have a recipe for big crowds. Winter rolls around and pushes the majority of anglers off the water, though. A lot of folks head to the hills for world-class skiing, leaving the rivers wide open and the fish relatively unpressured. It’s rare to have a banner day of catching loads of fish, but I’ll take fewer fish in exchange for solitude any day. I grew up in a dry-fly family. I never saw my dad or grandpa tie on a nymph, and for years I thought that was the only “real” way to catch trout. Thankfully, I’ve expanded my fly fishing game to include everything from streamers to mice, but I’ve retained a love for dry fly fishing. If I had the choice, I’d take dry fly fishing every time. Winter isn’t associated with dries, for good reason. But if you find yourself by a river with temps in the mid-30s, you stand a good chance to getting into a winter midge hatch. These bugs are tiny, and they’re why I carry size 24-30 parachute midge patterns in my winter boxes. You’ll want 6 or 7x tippet as well. Getting a good trout on a tiny midge in the middle of the winter is satisfying in a way “regular” dry fly fishing isn’t. It’s a feeling you have to experience for yourself. Rivers flow low and crystal clear during winter. This gives you the unique opportunity to memorize features normally covered by a few feet of water. Come spring and summer, you’ll be able to remember where submerged logs and boulders are, giving you an advantage in finding bigger fish. If you don’t spend a lot of time on the water during winter, make it a goal to change that this year. I promise you’ll be surprised. 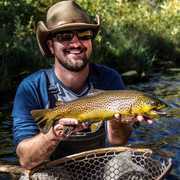 4 Winter Fly Fishing Go-To Spots for Every Angler If thin crowds, clear water, skittish trout and crisp mountain air are attributes of a perfect day of fishing, visit these four destinations.